When we shipped our yearlings last week, it took us a bit longer than usual to load the trucks. After their weigh-in, we brought all of the yearlings through the alley and chute of our working facility. Once they were in the alleyway Andy, our yearling guy, went to work with the magic wand. We sold our yearlings as Age and Source Verified. Age and Source is a voluntary trace-back program that verifies each animal was born on our outfit and we can verify the age of our yearlings. The calves we bought last fall were included with our homegrown yearlings and shipped last week. Most of those calves were also Age and Source verified. So, what do we do with this information? We pass it on down the line! 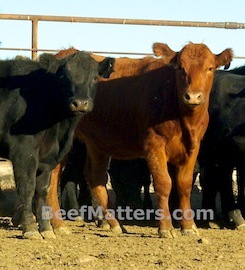 When we sold our yearlings last week, we provided the feedlots that purchased them with the Age and Source information. When the yearlings are ready for harvest the feeder sells the animals to a packing plant and the Age and Source information then goes to the packer. 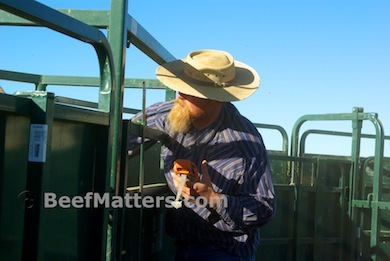 With the Age and Source statistics the packer can market that beef overseas to different countries depending on the specific trade regulations for each country. 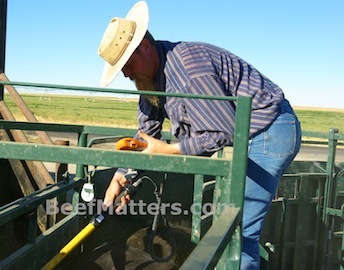 For example, some countries only buy beef that was younger than 30 months at the time of harvest. 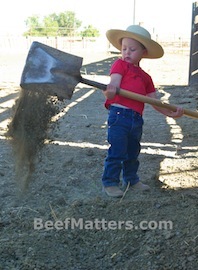 The only way to guarantee the 30 month age requirement is to market beef that has been Age and Source verified. If you look closely, you can see the small round electronic identification tag in the left ear of these heifers. 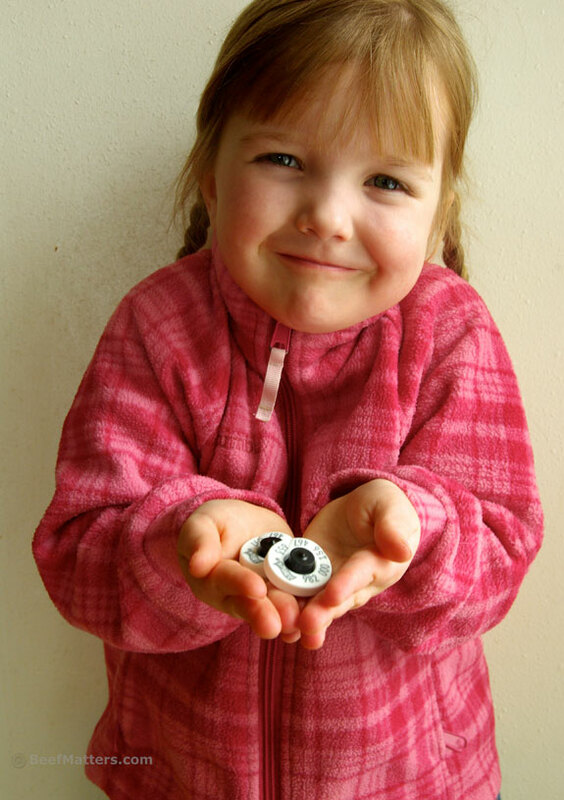 They are small tags, even in my five-year old daughter’s hands they still look small. However, they carry a lot of information. When Andy waves the wand about twelve inches from the ear tag, all of the statistics for that animal pops up on the screen of his hand held computer. Keeping all of our herd management records electronically is a huge time savings for us. I must admit that not everyone was caught up in the excitement of magic wands and electronic ID tags. 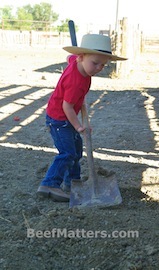 Playing in the dirt is a much higher priority for a certain little boy I know.